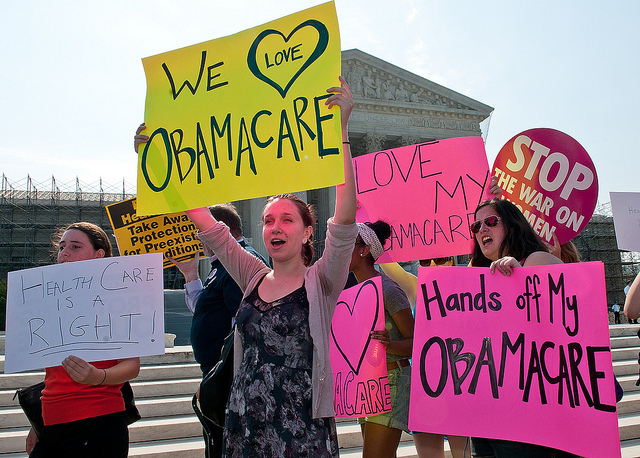 Protesters outside the Supreme Court as the ACA ruling came down Thursday morning. A scene from the Supreme Court following their ruling to uphold the ACA. As the Supreme Court ruling on the Affordable Care Act came down Thursday morning, politicians in Illinois and across America began to release their responses. Below are some of their statements, culled from Twitter, email and phone interviews conducted by WBEZ. "We&apos;re going to do whatever we can to do to repeal this law, because as Governor Romney said, this law is terrible for America." 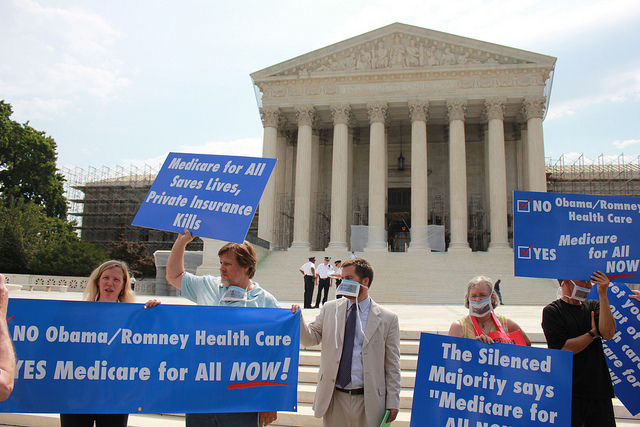 “Today the United States Supreme Court told the American People that they do indeed have a right to quality health care. I am pleased that the most important part of the Affordable Care Act, the individual mandate that makes the entire program possible, has been ruled constitutional. "Constitutionality should not be mistaken for good public policy. Although the Supreme Court today ruled that ObamaCare is constitutional, that does not change the fact that it will drive up the cost of health care, add to our already exploding debt and hurt job creation, including within our vibrant medical device manufacturing sector. "Standing outside the Supreme Court in our Nation&apos;s Capitol today as the ruling was handed down I was reminded of the passion this legislation has ignited among an overwhelming and consistent majority of Hoosiers who have rejected ObamaCare from the very start. “I applaud today’s decision by the United States Supreme Court upholding the Affordable Care Act. “In accordance with this historic ruling, the Cook County Health and Hospitals System will continue to seek a 1115 Medicaid Waiver from the work Centers for Medicare and Medicaid Services. This waiver, if approved by the federal government, would permit CCHHS to receive federal reimbursement for the costs of treatment provided to the tens of thousands of our patients who currently have no medical coverage but will gain access to Medicaid on January 1, 2014. “With or without the unpopular health mandate, the cost of care continues to rise, and it’s up to Republicans and Democrats alike to work across the aisle on solutions. I’m disappointed that the Court did not put a stop to the government overreach. But Washington still has a responsibility to fix polices that are raising costs, hurting job creation, siphoning millions from Medicare, and placing an added layer of bureaucracy between patients and their doctors.